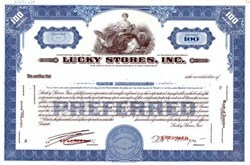 Beautifully engraved SPECIMEN certificate from the Lucky Stores, Inc. 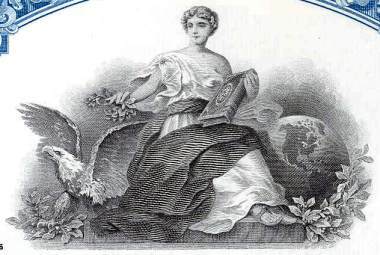 This historic document was printed by the Security Banknote Company in 1952 and has an ornate border around it with a vignette of an allegorical woman and an eagle. This item has the printed signatures of the Company’s President and Secretary. Lucky was incorporated in 1931 and had over 400 stores in California. In 1999, Albertson took down the Lucky Store name and replaced it with its own.